Tantalise the taste buds of your party guests as well as provide a visually stunning display in the form of a chocolate fountain. Hiring a chocolate fountain for your event can really provide a talking point, an ice-breaker at a corporate event, or a dessert station at a birthday party or wedding reception. 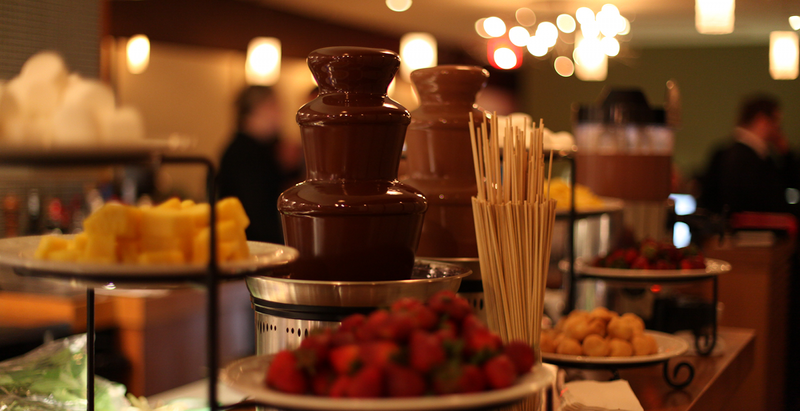 Whatever your event, hiring a chocolate fountain is something that is sure to go down well with everyone. As well as taking care of the complete set-up, and supplying all provisions, we provide a fully trained and experienced attendant to ensure that everything runs smoothly, and that there is always enough of everything; napkins, skewers, dipping fruits, marshmallows, and of course chocolate. Whatever you specify, we will try to supply it all, and make sure your guests continue to enjoy a never ending flow of chocolate throughout the event. Whether you want dark chocolate, while chocolate, milk chocolate, or even flavours such as choc-mint, chocolate fountains can be provided upon your request, along with dipping fruits and waffles. You can even theme your chocolate fountain hire and display, which works well for weddings and elegant events, or kids parties; think uniform dark or white chocolate and strawberries, colourful tropical fruit and a milk chocolate fountain, or marshmallows and short bread with all the chocolate choices available. We supply chocolate fountains to many areas over the South East, such as Brighton, Dartford, Guildford, as well as London. So, if you are looking to hire a chocolate fountain, be sure to get in touch with KG Entertainments. We make it easy by providing all your entertainment needs, so check out our other services such as DJs, Photo Booths and fun Casino tables.